* * * * * * * * * * Welcome to Dru's Cozy Report: January 2014. This month I have two new series for your reading pleasure, and highlights from recent releases. Enjoy! Izzy McHale wants her new Trendy Tails Pet Boutique in Merryville, Minnesota, to be the height of canine couture and feline fashions. But at the store’s opening, it turns out it’s a human who’s dressed to kill. Izzy’s own beloved pets are dressed to the nines for the grand opening of Trendy Tails. Feisty feline Jinx is large and in charge, and happy mutt Packer is lapping up the attention. Izzy and her best friend Rena have their hands full meeting Merryville’s menagerie and serving tasty pupcakes and kitty canapes from their “barkery.” The last thing they need is Sherry Harper, the town's local activist, scaring off customers and getting tongues wagging by picketing the event. 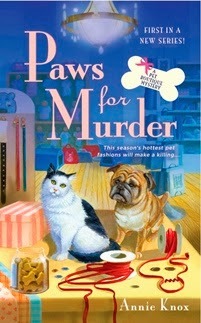 As many cozy mysteries that I read, I liked this one as it was quite different in that you never really saw the police investigating this murder, but instead you had a Izzy, our heroine and Sean, the lawyer, looking for others with a stronger motive to have murdered the local activist than Izzy’s best friend. This was a fast-paced, action-filled drama that once I started I could not put down. I love the comfortable tone and the ease at which each chapter flowed from one to the other. The author did a great job in keeping the suspense going and it was fun narrowing down the list of suspects as each clue gathered kept the pages turning in this wonderful tailor-made mystery. 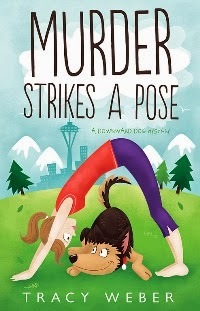 It was fun getting to know each of the main characters including their four-legged friends, from Izzy, to her sisters, and family and friends. The author description of the animals outfit had me looking for a picture of Packer in his cute little Hells Angel’s outfit. 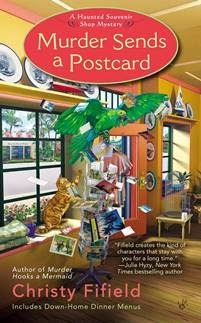 With a lovable, yet quirky cast of characters, witty and engaging dialogue and a feel good atmosphere, this book is full of tailor-made charm and I can’t wait to see what adventures awaits Izzy and her friends in this wonderful addition to the cozy genre field. Welcome to San Fernando Valley, California, where Martha Rose and her coterie of quilters are enjoying life on the good side of retirement—until murder pulls a stitch out of their plans. Martha and her besties Lucy and Birdie are set to expand their Quilty Tuesdays by inviting newcomer Claire Terry into their group. Though at forty Claire's a tad younger than their average age, her crafty reputation could perk up their patchwork proceedings, especially as they prepare for the fancy quilt show coming to town. 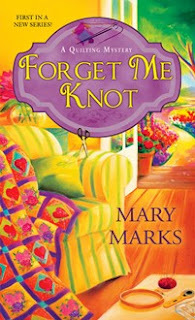 But when they arrive at Claire's home and find her dead inside the front door, and her exquisite, prize-winning quilts soon missing, Martha is not one to leave a mystery unravelled. Especially if she wants to stop a killer from establishing a deadly pattern. The author did a good job in delivering a fast-paced, fun and lighthearted whodunit centered around three quilters who happened to find the dead body of another quilter and what followed was their eagerness to find a murderer who’s hiding in plain sight. With plenty of suspects to choose from, I loved the twists and turns the mystery took as it rapidly pulled me into an intriguing storyline where secrets are uncovered and threats are made. Everyone had a role to play and it was done in a way that each clue gathered took us closer to the killer’s identity. This was an enjoyable read featuring a lovable cast of characters and good conversations in this engaging debut novel. You don’t necessarily have to be a quilter to enjoy this book, but the tidbits and tips will add to a quilter’s repertoire. I look forward to more exploits with Martha and her friends in this lovely new series. FTC Disclosure - The author sent me a copy of this book, in hopes I would review it. When an enchanted grove is set ablaze, Ella realizes she has more grave problems. With her magic waning, she’s going to have to sleuth from scratch to stop an arsonist who has no respect for sacred ground—or human life. Adding fuel to the fire, Stella’s parents soon arrive—with her ex-boyfriend—hoping to persuade her to return to Chicago. Now Stella is torn between the life she left behind and uncovering what happened to her ghostly friend. But she’d better think fast or more than her investigation could go up in flames. Food and cocktails columnist Hayley Powell is not looking for love this Valentine's Day. Of course she also isn't planning on looking for a murderer. Turns out Bessie had more enemies than a boxful of chocolates, each one a suspicious flavour. It's sticky business juggling a job, two teenagers and finding a killer, but it's better than letting a killer find Hayley first. Alone in the mountains, Gracie will have to use all her expertise to keep Rob alive. But with an unknown killer lurking somewhere in the dark, even that might not be enough to save them. Hey Dru, nice list. There were a couple of books listed that I'm surprised I hadn't heard about months ago. Some great new reads! I've read a couple of them and a few are on my TBR. Thanks, DruAnn! Another good list. We value you work for mystery readers and authors. Thanks for the reviews, Dru. I always enjoy them and get ideas for new series I otherwise wouldn't hear of. Hey, Dru! Thanks for putting Murder Strikes a Pose on the list!